Prokofiev and Shostakovich look on as Kirill Karabits makes his season debut alongside an eminent cellist and a vivacious symphony that took Georgian London by storm. “This wonderful man never fails” declared The Morning Chronicle after Haydn’s benefit performance of his tribute to the city that had taken him to its heart – a symphony bristling with wit and elegance; it’s one of the peaks of the classical era. Paving the way is the wry neoclassicism of the student Prokofiev’s delightful Sinfonietta and Shostakovich’s Cello Concerto No.1 – a piece with its composer’s name literally written all over it, his initials spelled out in the opening notes. Karabits and the BSO have been attracting 5-star reviews for their ongoing Prokofiev symphony cycle on the Onyx label and turn their “persuasive command of the idiom” (The Telegraph) on the engaging early symphonyin- miniature. There’s nothing miniature though about Steven Isserlis’ profound rapport with Russian music. Arguably one of the top five cellists in the world today, when Isserlis plays “the temperature rises palpably” observes Sinfini Music. Acclaimed worldwide for his technique and musicianship, British cellist Steven Isserlis enjoys a distinguished career as a soloist, chamber musician, educator, author and broadcaster. As a concerto soloist he appears regularly with the world’s leading orchestras and conductors, recent engagements including performances with the Berlin Philharmonic, Budapest Festival, Philharmonia, Cleveland, Minnesota, and NHK Orchestras. He gives recitals every season in major musical centres, working with pianists such as Jeremy Denk, Kirill Gerstein, Stephen Hough, Alexander Melnikov, Olli Mustonen, Mikhail Pletnev, Andras Schiff, Connie Shih and Dénes Várjon; and plays with many of the world’s leading chamber orchestras, including period-instrument ensembles. Unusually, he also directs chamber orchestras from the cello, in classical programmes. As a chamber musician he has devised and performed in programmes at many of the world’s most famous festivals and venues, including the Wigmore Hall, the 92nd St Y in New York, and the festivals of Salzburg and Verbier. These specially devised programmes have included ‘In the Shadow of War’, a major series for the Wigmore Hall to mark the centenary of the First World War; explorations of Czech music; the teacher-pupil line of Saint-Saens, Faure and Ravel; the affinity of the cello and the human voice; varied aspects of Robert Schumann’s life and music; and the music of Serge Taneyev (teacher of Steven’s grandfather, Julius Isserlis). For these concerts Steven is joined by a regular group of friends who include the violinists Joshua Bell, Pamela Frank and Isabelle Faust, violist Tabea Zimmermann, and clarinettist Michael Collins. He takes a strong interest in authentic performance; in addition to working with many of the foremost period instrument orchestras, he gives recitals with harpsichord and with fortepiano. With Robert Levin, playing on original or replica pianos from Beethoven’s era, he regularly performs Beethoven’s complete music for cello and piano in two recitals. He is also a keen exponent of contemporary music, and has premiered many new works, including John Tavener’s The Protecting Veil (as well as several other pieces by Tavener), Thomas Adès’s Lieux retrouvés, Stephen Hough’s Sonata for Cello and Piano Left-hand, Wolfgang Rihm’s Concerto in One Movement, David Matthews’ Concerto in Azzurro, works for cello and piano by Olli Mustonen, and ‘For Steven’ by György Kurtág. Writing and playing for children is another major interest. Steven Isserlis’ books for children about the lives of the great composers – Why Beethoven Threw the Stew and its sequel, Why Handel Waggled his Wig – are published by Faber and Faber. He has also written three musical stories for children – Little Red Violin, Goldiepegs and the Three Cellos and Cindercella – with music by Oscar-winning composer Anne Dudley; these are published by Universal Edition in Vienna. As an educator Steven Isserlis gives frequent masterclasses all around the world, and for the past seventeen years he has been Artistic Director of the International Musicians’ Seminar at Prussia Cove in Cornwall, where his fellow-professors include Andras Schiff, Thomas Adès and Ferenc Rados. As a writer and broadcaster he contributes regularly to publications including Gramophone and The Guardian, has guest edited The Strad magazine, and makes regular appearances on BBC Radio, most recently as writer and presenter of a documentary about the life of Robert Schumann, and as guest presenter of two editions of Saturday Classics. His diverse interests are reflected in an extensive and award-winning discography. His recording of the complete Solo Cello Suites by J.S. Bach for Hyperion met with the highest critical acclaim, and was Gramophone’s Instrumental Disc of the Year and Critic’s Choice at the Classical Brits. Other recent releases include the Dvorak Cello Concerto with the Mahler Chamber Orchestra and Daniel Harding; the complete works for cello by Beethoven with Robert Levin on fortepiano, selected for the Deutsche SchallplattenPreis; and recital discs with Thomas Adès and Olli Mustonen. Future releases include Prokofiev and Shostakovich concertos with the Frankfurt Radio Symphony and Paavo Järvi, and recital discs with Stephen Hough and Richard Egarr. 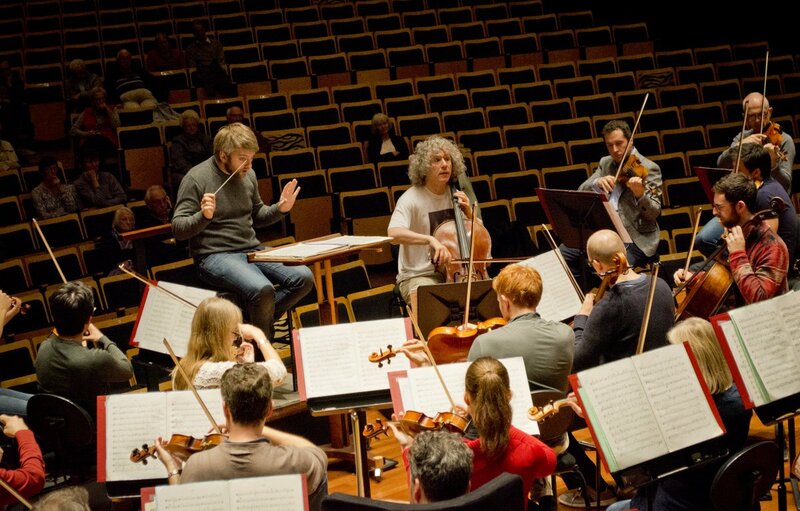 The recipient of many honours, Steven Isserlis was awarded a CBE in 1998 in recognition of his services to music, and in 2000 he received the Schumann Prize of the City of Zwickau. In 2013 he became one of only two living cellists to be inducted into Gramophone’s Hall of Fame.